Is 60 Too Old For a Mommy Makeover? The popular term Mommy Makeover is a combination of an abdominoplasty (tummy tuck) with breast surgery, usually a breast reduction or a breast lift with or without breast implants. Both procedures are complex and extensive. The patient’s chronological age is not as important as the physiologic age. If the patient receives medical clearance from their doctor, making sure that heart and lung functions are good, and there are no other medical issues, the patient should be able to proceed with surgery. If there is any concern, it is possible to stage the procedures, doing them one at a time. 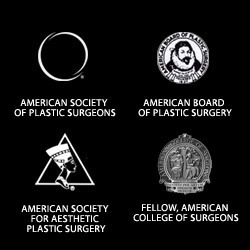 Safety for the patient is of utmost concern, and all aspects need to be evaluated by a Board Certified Plastic Surgeon. Pictured above is a 62 year old San Francisco Bay Area patient that had her Mommy Makeover staged. She had a tummy tuck first, then a year later had her breast reduction surgery. This entry was posted on Saturday, November 17th, 2012 at 11:21 am	and is filed under Body Contouring, Body Sculpting, Mommy Makeover. You can follow any responses to this entry through the RSS 2.0 feed. Both comments and pings are currently closed.